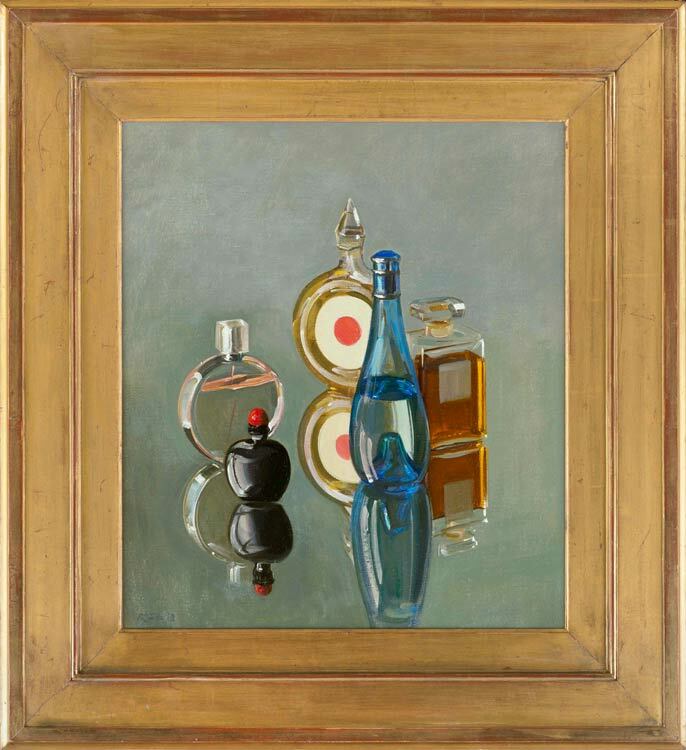 A vibrantly colourful decorative piece which is almost an abstraction, this painting of a group of scent bottles seems a work of pure representation – a study of surface effects and physical attributes. It trails behind its innocent appearance, however, a long art historical backwash of emblematic objects, which has worn its way so far into the collective consciousness that it can appear out of context and still trigger the same response to its meaning. Here is the toilet of Venus without the need for Venus; an evocation of beauty preparing for conquest, like the School of Fontainebleau painting in the Louvre (c.1550) in which Cupid hands Venus a gold flagon of scent, or Georges Seurat’s Young woman powdering herself (1890, Courtauld Institute), where the handmaiden and Cupid have vanished, leaving Venus alone with her looking-glass and scent bottles. Rose’s picture is a vanitas from which Venus herself has now disappeared; – but it is also a painterly game, in which the artist choreographs reflections, transparency, and the fall and refraction of light. For a further appraisal of this painting, please click here.